The Russian company Volga-Dnepr Airlines, dedicated to outsize and super-heavy transportation, has successfully delivered a Krones bottle-filling machine and a variety of additional equipment for LS International Cargo GMBH. The load consisted of 9 packages with a total weight of 58 t. The cargo measured 442 cbm with the largest pieces weighing 17.86 tonnes and 11.56 tonnes. This operation was carried out using an An-124-100 freighter. The cargo was loaded in Munich, where Krones’ nearest production facility in Germany is located, to be delivered to Entebbe, Uganda for Crown Beverages Limited, one of the leading soft drink bottler in the country. 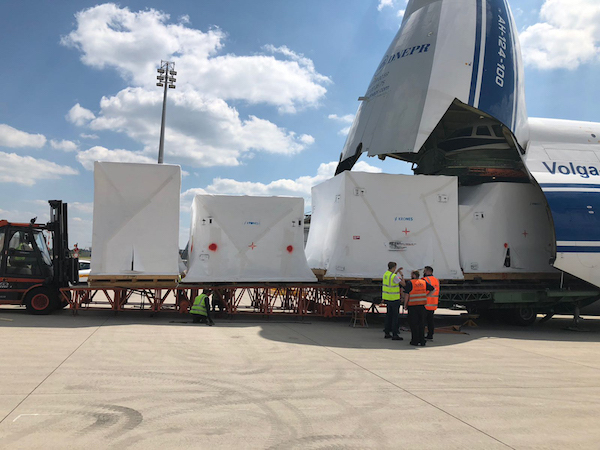 A team of specialists from Volga-Dnepr started with the freight inspection in Munich to find the best loading solution , provide suggestions for cargo preparation and to minimise the time required for airport handling procedures on the day of departure. 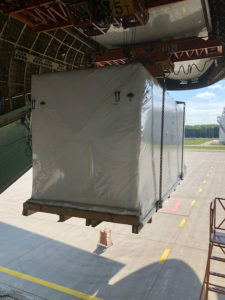 On the day of the flight, the machinery was loaded into the An-124-100 using special loading equipment and delivered to Entebbe International Airport. 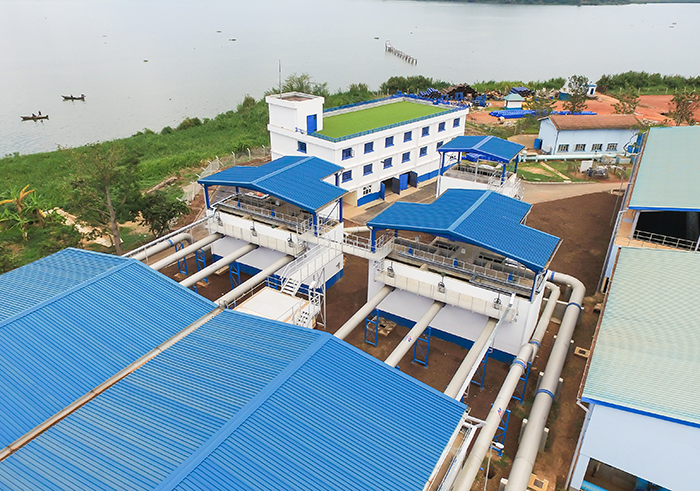 In August, the Vinci group subsidiary Sogea-Satom began working on the construction of a drinking water treatment facility in Katosi, near capital Kampala in Uganda. It includes designing and building a facility which will treat 160 000 cubic meters per day. Granted by the National Water & Sewerage Corporation (NWSC), this jobsite follows sewerage works DN 1400 on 10 km, downstream of this new facility, which has begun in September 2017. These pipes transport the treated water from the facility located in Katosi up to Kampala. Actually mainly powered by the water treatment facility Gbaba, Kampala will count on twice more drinking water at the end of the works. 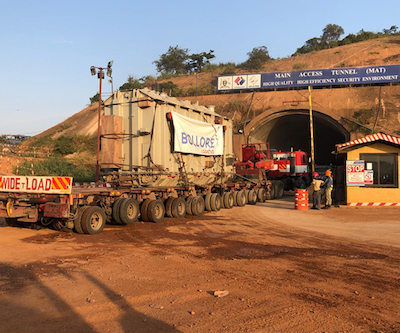 Bolloré Logistics teams from Uganda and Kenya have collaborated to transport construction equipment items for a major project in Uganda. In 2015, Chinese Group Power China, whose subsidiary Sinohydro specialises in the construction of dams, began the construction of the Karuma power station, the first underground hydropower plant with a capacity of 600 MW. Located on the edge of the Nile, in northwestern Uganda, the country hopes to meet the growing demand for electricity with this project. In October 2016, Bolloré Logistics ensured the shipment of the trucks carrying the goods, as part of the contract including unloading and transport from the port of Mombassa (Kenya) to the Karuma yard (Uganda), 1,285 km in 12 days. As a part of the same contract, in 2018, the international transport and logistics specialist transported and unloaded a 98-ton container to the 15 km long and 450 m deep tunnel. The tricky part of this task was the accessibility and means of movement in a narrow tunnel with a inclination of about 12 degrees. Thank to the adapted solutions, such as the deployment of a rail system access, tilting of the container or the moving of trailers in reverse, the entire transport was carried out without accident. Today, 85% of the work has been completed and the project will be finished in 2019.